Natural Air Freshener is safe for your pets and your home environment. How does it work? A blend of organic plant oils absorbs and dissolves the odor molecules and destroys them. It then replaces the bad odor with a refreshing citrus aroma. It contains no phosphates, nitrates, NTA, sulfates, sulfonates, caustic or other known pollutants. This Air Freshener refreshes and invigorates areas by neutralizing bad odors while replacing them with a delightful, natural fragrance. Organic Lemon oil has antiseptic properties as well as an uplifting aroma. Why use toxics around your pet? You never want to put your pets in harms way, but pets are closer to the floor and are exposed to higher concentrations of toxic chemical cleaning products. 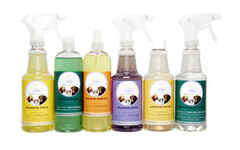 Our natural formula contains no Volatile Organic Compounds (VOCs), so it is safe for use around people and pets. Your pets won't be ingesting toxics when licking the floor or grooming themselves. Organic and Nature's Natural Air Freshener contains no animal byproducts. This product was formulated from the latest and safest natural technologies available and contains no solvents, sulfates, glycols, or phthalates.